Had the very best time exploring Prince Edward County and installing a large sculptural artwork at the one and only Drake Devonshire last weekend. I am honoured to have been given the opportunity to install a piece just steps away from murals and installations by artists such as FAILE, Trevor Wheatley, and dozens of others - this place is the real deal. It is located right on the beach in Wellington Ontario, has a beautiful collection of artworks curated by Mia Nielsen, an amazing restaurant and bar onsite, and some of the nicest hotel rooms in the country - all surrounded by dozens of wineries and craft breweries. I would highly encourage anyone and everyone to pay a visit and take in everything the Drake has to offer - it's a lot! 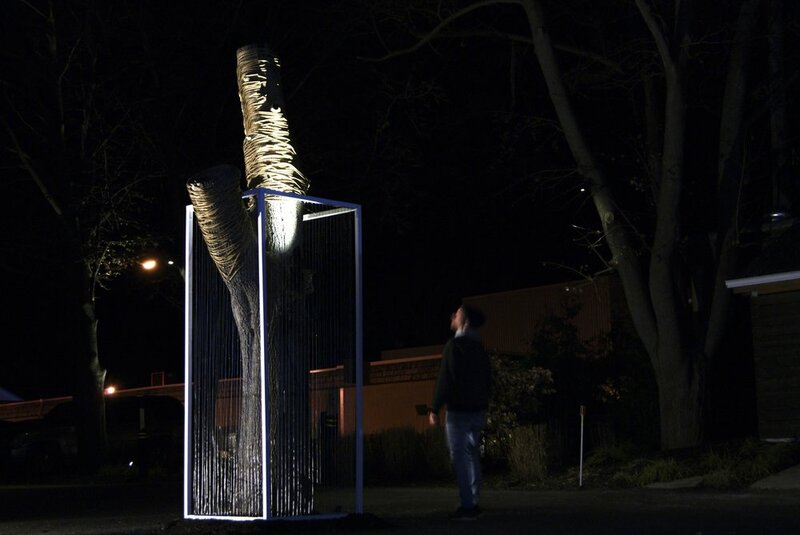 The sculptural work consisted of a white rectangular prism installed encompassing an old tree stump located just outside of the front entrance of the Drake. 1000ft of horizontally strung wire encloses the the tree within the prism, while the areas of the tree protruding above and outside of the prism are wrapped in 1000ft of gold rope. The piece is meant to explore and represent personal and societal progress, possibility, and empowerment. Thank you to Mia Nielsen, James Fisher, and the Drake for having me, as well as a very special thank you to my wife who stayed out in the cold with me all day and into the evening to get this thing together. Catch my installation at the Drake Devonshire until late spring 2018.